Sires stakes, Grand Circuit stakes and the Hambletonian Trail races share the limelight from this weekend to the end of the year. As the entire population focuses on Churchill Downs on May 3, potential stars take aim at making noise and money in harness racing stakes. It’s just the beginning on the first weekend in May. There may be little reason to leave your Internet connection on Saturday, since you can follow all of Churchill Downs’ exciting Kentucky Derby program on line and go directly into night time action with a bevy of harness tracks to browse for prospective betting events, many that are listed below. The H2W, on our exclusive list for TwinSpires harness blog, is rich with probable profits from overnights across North America as the 2014 stakes season gets underway. Use these suggested contenders that are proving productive across-the-board wagers and serve as profitable members of exotics. Grand Circuit stakes series named after historic horseman John Simpson begin for 2014 at the Meadowlands on Saturday, May 3 with a $47,253 event for soph-colt pacers. This is the first outing for the glamour-boy division that will dominate so many headlines as the season ensues. Ten colts, two of them in a PJ Fraley entry, go to the gate. All but one has already made a seasonal debut—Somewhere Fancy won two of six at two for Linda Toscano—and three have already won as sophomores. Last year’s Governor’s Cup winner, JK Endofanera, Ron Burke’s addition, comes off of two winning qualifiers. He was never worse than second at two. Joe Holloway’s Stratos Hanover is two for four already and can be forgiven for his loss in last week’s “Reynolds” for a tough trip. Considering the obvious name power behind those, we hope for the crowd to overlook Jet Airway, one of the colts returning at three in his first effort. He was coming around during the Red Mile meet after some success in Canada and has qualified well to take on his soph campaign. The Meadows opens for a Saturday on Kentucky Derby Day and offers Pennsylvania Sires Stakes (PASS) action. Three divisions of soph-filly pacers from stallions in the Keystone State are featured in the first round of lucrative miles offered by the PASS program. In round one, worth $69,982, our Courageous Lady pick, That Woman Hanover, should dominate, though we don’t expect the 7-1 offered to us when she raced second last week in the feature at Northfield. It’ll be your judgment for value but we cannot look beyond her in the first of the PASS miles. The round-two ($70,382) choice will most definitely be the Dave Palone-driven Weeper. We will dismiss the obvious there for a price with Upfront Badgirl. Improvement is the key with her, along with the crowd’s refusal to support anything but what everyone can see on paper. Look for a price well worth the bet. The nightcap may appear to be a tight fit for all but Brian Brown’s Sister Stroll may have an edge. With only one start and one third she has earned over $13,000 and should improve upon her mark, a qualifying time slower than the rest here but moot in the scheme of things. An aggressive drive is almost guaranteed with Aaron Merriman, along with a price worth the backing. Also beginning this weekend is the Hambletonian Trail, the journey of three-year-old colt and filly trotters to the first weekend in August for the Hambletonian and its “Oaks.” It’s another traditional start at Freehold, with the fillies first, going in two divisions of the Lady Suffolk on Friday, May 2. Both short fields are worth $33,075. In split one, none of the five gals are eligible for the Oaks. Bella’s Spunkin comes into the stake with two wins in three starts, while the others are nowhere near as savvy so far. Suegrabbitnrun, from the productive Schnittker barn, is showing promise and if she improves she could win here as a second or third choice. The first three from the inside out are Oaks-eligible in the second division’s quintet. Mistresswithmuscle, Cee Bee Yes and Glams K look to begin the Trail with success. The latter is the most experienced so far; all the others are new to the season. Cee Bee Yes comes from the Julie Miller barn and even with husband Andy on the mend and just about guaranteed to miss returning to the bike by August, the Millers are gunning for both crowns. “Yes” could be more than ready to start the Trail with a win, though a mutuel price is up for grabs. 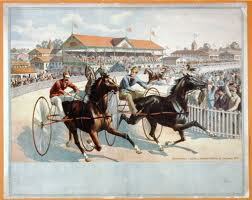 Saturday's Dexter Cup is analyzed in our spin-off blog, The Hambletonian Trail. This is nice as you describe it. I really like people who write well on their blog. I wanted to thank you for this great read! !